Photo: Ron Galella/WireImage via Getty Images. Graphic: Natalie Peeples. When I was a poor twentysomething writer in Chicago in the ’90s, I didn’t go to church. I instead worshipped, every weekend, at the altar of Martha Stewart Living. In my frequently semi-hungover state, there was nothing better than Martha’s home improvement show airing on Sunday mornings, reminding me to order my fall bulbs early and to ice my chicken before frying it. Of course, I would do none of those things—I had no yard of my own to plant in, and my culinary pursuits at that point were mainly limited to making hummus and baking cookies—but I, like millions of Americans, remained riveted by Martha Stewart. The Martha of 20-odd years ago was a far cry from the razor-tongued grandmother who now takes down Justin Bieber on comedy roasts. Before Snoop Dogg, before Macy’s, before lying to investigators about a well-time stock sale, Martha Stewart was a mellow household guru of the small screen, usually in solid-colored shirts and sweaters with khakis or jeans—rarely a pattern, never a skirt, her only accessory a sturdy wristwatch. The former model had kicked off her empire after renovating a farmhouse in Connecticut with her (now ex) husband, publishing mogul Andrew Stewart. Martha Stewart had absorbed years of cooking, sewing, and gardening knowledge from her parents and grandmother, and she soon started a catering company. At one of her husband’s parties (which she catered), she met another publishing exec, who encouraged her to publish her first book, Entertaining. This led to a series of books; then a magazine with her own name on it, Martha Stewart Living, in 1990; and the corresponding half-hour TV show in 1993. Watching the show now, I’m shocked that this seemingly mild-mannered woman would become the first female, self-made billionaire in the U.S. by showing us how to make our own book covers out of fabric. But Martha Stewart came along at the exact perfect moment in the American zeitgeist—the same fervor that made Home Depot expand from 19 stores in 1984 to 350 stores and sales of $10 billion around 10 years later. Wary after the Bush recession but a little flush in the Clinton era, Americans turned their attention inward to create their own domestic palaces, doing it themselves. (Not for nothing, Home Improvement was one of the top-rated TV shows of the ’90s.) These DIY newbies looking for guidance would find the perfect lifestyle guru in Martha Stewart. Her knowledge of a variety of domestic arts is astounding; her plant and gardening knowledge, especially, rivals that of a university-level botanist. (I don’t know how many geranium dealers there are in the world, but I think they all wound up on Martha Stewart Living eventually.) She embodied cool New England charm, welcoming but not overenthusiastic, cheery but a dirty-blond hair short of cheerful. 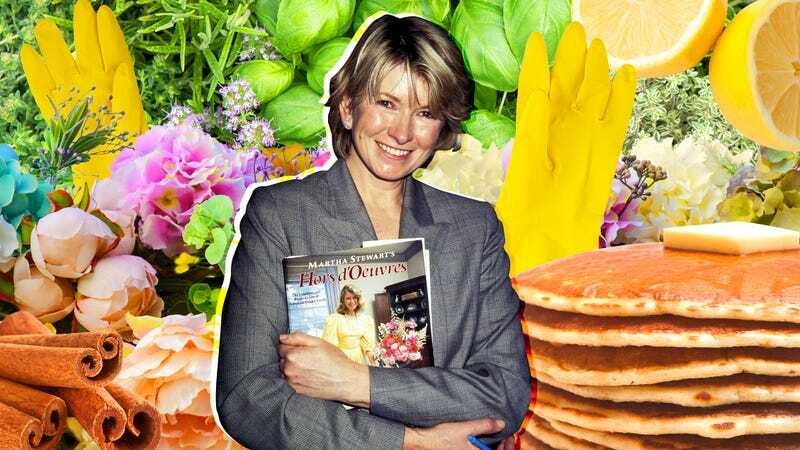 Her soothing voice filled almost every minute of Martha Stewart Living, unfolding at a meditation-inducing monotone as she walked you through making clarified butter or planting a rose bush. In a transcription of all the episodes of Martha Stewart Living, exclamation points would be few and far between. I could have listened to her for hours. Nevertheless, it was Martha’s tendency to go over the top occasionally that so thrilled me and my less-than-domestic friends. I’ll never forget the morning she was making crème brûlée, and suddenly and nonchalantly pulled out a blowtorch to top them off with a caramelized crust. Sure, now you might see such showy fireworks tableside at a restaurant, but at the time, it was mind-blowing. When her crafts specialist came on to show us all how to make a letter holder out of sparrow wire, Stewart enthused, “This is the same kind of wire I use for my birdcages!” about as excited as we’d ever seen her. That was the thing about Martha Stewart. Her projects from her cozy, homey studio and lush gardens were maddeningly simple yet unattainable. None of us had a specific wire we used for our birdcages. “These are leeks that I grew from seeds that I found in France” was not a sentence that could roll off of anyone else’s tongue in the world with any sort of agency. Yes, her jack-o-’lantern pumpkin tarts were adorable, but who among us had 12 little porcelain tart cups at the ready, along with appropriate cooling racks? I didn’t know anyone with a sewing machine at that point in my life, let alone a standing mixer. I wasn’t about to buy a wreath, so I was even less likely to collect all the tools and supplies to make one myself. And yet, there were enough little tips on Martha Stewart Living to make even my crap apartment seem homier. I watched voraciously every week trying to scrape them together. Even I could start collecting milk glass by searching it out at garage sales and thrift stores, and create a beach glass collection in a mason jar. Or could pick up an inexpensive bunch of flowers at the grocery store to liven up an end table. One Christmas I gave everyone beeswax candles, after she showed me how easy it was to roll them up. I’m pretty sure that Martha Stewart is the only reason I’ve ever owned a hot glue gun. Mostly, I absorbed her cooking tips, as out of all her projects, they seemed the most accessible—especially since, like Martha, I was a huge fan of both butter and cream. (Her recipes are usually delicious, but rarely health-focused.) My mom and I relied on Martha’s shortbread recipe for years at Christmas. And I have never put a wooden spoon in a dishwasher, not since Martha Stewart sternly cautioned me not to. As much as I once loved these shows, I hadn’t seen them for years. Luckily for me, there is a diehard vintage-Martha fan named Joseph Patz who has uploaded hours and hours of these old shows to YouTube. This is a dangerous discovery, because I find them as compelling now as I did as a twentysomething (and judging from the comments, I am not alone in my nostalgic enthusiasm). Possibly because I now have more house to care for and decorate and more people to feed, watching these shows today, I automatically start making a list in my head of fall bulbs to purchase. And decades later, I still find the episodes impossible to turn off. Martha’s gentle yet commanding persona remains a siren call to my own frustrated inner domestic goddess. I would still follow Martha Stewart, especially 1990s Martha Stewart, off of an autumnally decorated cliff. Naturally, she also has her own YouTube channel, which features some of these vintage clips. Sadly, her newer ones are faceless and fast-paced, a far cry from the Martha Stewart Living of old. You can still see Martha on TV now, but it’s as a judge on Chopped or co-hosting the (Emmy-nominated) Martha & Snoop’s Potluck Dinner Party. But those flashy sets are a far cry from the lowercase fonts and acoustic music of her first TV series, where the most exciting guests were her pets that showed up in her garden. That initial half-hour weekly show soon led to a daily one, and then expanded to an hour. After her release from prison in 2005, Stewart launched a comeback with talk shows like The Martha Stewart Show and Martha, as well as frequent appearances on the Today show and elsewhere (she even hosted her own Apprentice on NBC). She also built product lines at retailers like Kmart and Macy’s (I remembering reading that Martha Stewart paint colors were inspired by the various colors of the eggs of her chickens). Eventually, it was as if she had never left. Especially since she is now rightly credited as the first person who brought these lifestyle skills to the forefront. Now, of course, there are entire channels like HGTV dedicated to home-related pursuits. But there doesn’t seem to be one particular person who can take you from garden to kitchen to craft room in a mere half-hour like Martha Stewart did in her heyday. I find that then, as now, Martha Stewart Living still constitutes the perfect, aspirational way to kick off my week. Regardless, even with all her wealth and fame, I honestly hope Martha Stewart still finds some joy in domestic life. Granted, her residences currently include a massive home in Katonah, New York, and the Skylands estate—the former summer home of former Ford president Edsel Ford—in Seal Harbor, Maine. I like to imagine that she still hangs out in that Jens Jensen-designed Skylands garden with her pets—away from the omnipresent cameras that capture her solidly public persona—perhaps happily weeding and digging up rutabagas in her vegetable patch. It would seem only appropriate, after Martha Stewart opened up so many of those homespun worlds for the rest of us.